Experimental local artist Elaine Yan Ling Ng is one of the stars of Hong Kong Art Week. Her spectacular “Sundew” takes center stage at this year’s Art Central, an enormous Swarovski-commissioned piece which saw the multimedia artist use textiles, electronics, biomimicry (innovations that mimic nature) and approximately 20 million crystals to create. The Loop caught up with Ng to discuss the state of Hong Kong’s art scene today, the innovations in digital tools and what the artist hopes for the future. 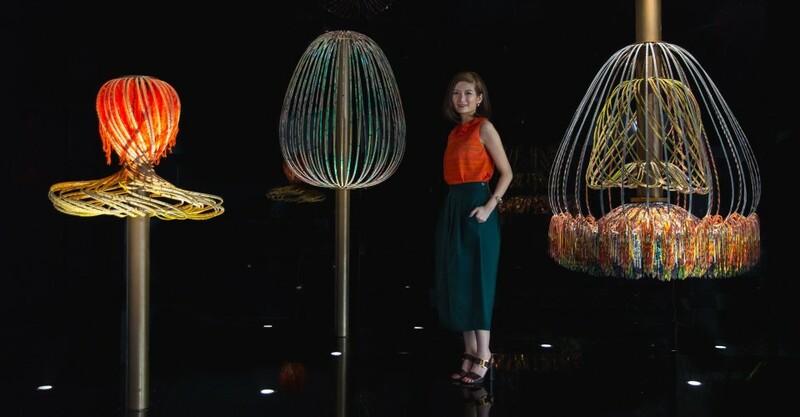 Ng, an award-winning Central Saint Martins (CSM) grad, made a name for herself in Beijing before relocating to Hong Kong, where she works with cutting-edge design technologies from her New Territories studio, The Fabrick Lab. She is as progressive as an artist gets. A degree in Textile Futures paved the way for a career working with international design companies like Nissan Design Europe and Nokia Design Beijing. Meanwhile, her New Territories-based studio is love letter to technology, where the boundaries between the human and digital worlds become blurred. Art has been seen as a commodity in the past — buyers here are not as intellectual as internationals, they don’t question the materials and how it’s been done, but they look for names and bigger gallery brands. So that doesn’t favor the emerging artists at all. But since more festivals have entered Hong Kong, it’s really helped to engage the public, and let them know that there are more than just bigger galleries and brands. People are now starting to look for and see a really interesting mix of media and techniques. Some Hong Kong galleries have stopped looking at bigger names and are trying to discover local artists who have not been seen before. But in terms of the size of installations or objects, Hong Kong doesn’t favor artists — space is limited, so not a lot of galleries would install oversized objects. But there are potentials, because there are a lot of new developments coming up to accommodate more work of this nature. Hong Kong is a huge financial center, but a lot of buildings have very small spaces. A lot of designers can’t afford the rent and can’t install their machines. If you can’t manufacture your own things, then you’ll be forced to compromise in terms of production. But a lot of the second-generation and third-generation manufacturers are bringing in a micro-factory system in some older, larger spaces. That way they can get really experimental, and they can also employ more experienced craftsmen. That way, a whole ecosystem will develop. What I’m very interested in is the regeneration of existing places, like The Mills [a former textile mill in Chai Wan Kok]. Hong Kong was a textile hub back in the day, and the founder of The Mills really kept the heritage of the building, and transformed it into something that’s accessible and modern. If you look at Hong Kong as a hub, rather than an isolated city – well, it’s attached to Shenzhen, so the market is great here because there’s a lot of Chinese investors that come through, and people love art in China. It’s definitely used more as a hub, especially as far as resources go. I go to Shenzhen and Guangzhou a lot to source machines — a lot of the resources are only a couple of hours away. I found that I had to consider Hong Kong as a hub when I was living in Beijing, because it took so long to get anything done there. Hong Kong is only an hour away from Shenzhen by car, so we should really look at removing the physical boundaries and start traveling a bit more. Also a lot of workers from different cities go to Shenzhen to work, so they have talent in terms of craftsmanship, too. I think [looking at Hong Kong as a hub] is a good thing, because this can allow for collaborations, cross-branding. In terms of the finance side, people will see opportunities. I’m very excited about the Shenzhen Design Museum — I’ve seen the site, it’s really, really big in terms of space, height and also the location is very connected to Central Hong Kong. It’s only an hour’s boat ride or MTR ride. I think it will add value to Hong Kong, as well as to Shenzhen. Large-scale works like Antony Gormley’s Event Horizon offer a new dimension to local people. At the moment, I think art in Hong Kong is so glorified, it’s a social scene. Having different types of artwork and bringing it closer to the public will be a much better thing. Galleries are not very easy to approach — you feel very intimidated when you walk into a gallery in Hong Kong. That doesn’t help people who aren’t in the scene to grow their interest. So I’m hoping these boundaries will be removed, so it’s easier for everyone to enjoy art. There are a lot of local artists expressing their points of view through art; it’s a really interesting way to record history. Hong Kong is a free trade city, so no one’s going to stop artists from doing anything. But all work is open for interpretation. While a lot of Hong Kong artists are using old techniques, digital tools are also becoming more prominent and being used to better effect. Things that have been done by hand in the past can be easily replaced by digital [tools] and artists here are being clever about it. Right now, we’re seeing things like CNC machines, 3D printers, 3D pens, LEDs, metal etching — there’s a mix. I think there’s an interesting approach of using raw materials as well, for slightly unrefined finishes. Also video art — in Hong Kong I’ve found there’s a lot of digital media artists using projections to produce a lot of video work. A lot of fine art here is now reflecting society’s problems, especially though documentaries. Even though digital art is becoming more prominent, a lot of artists are also borrowing techniques from the older generation. I feel that artists in Hong Kong have, more and more, been seeking out old master craftsman skills. A lot of these older skilled workers don’t have an apprentice to pass on the skill to, so artists have stepped in. I think that’s really meaningful. And it keeps heritage alive — people often say that Hongkongers don’t have identity, but through art we can really find our own identity. The economy will continue to have a huge influence in the Hong Kong art scene — not just our local economy, but globally. Because a lot of the galleries are not from Hong Kong, and also a lot of buyers are from China, we’ll have to watch how the market moves. I hope we’ll see a lot more intricate techniques, maybe more textile-based approaches. It’ll be great to see more public sculptures that are less commercial. I’d love to see a London-like scene develop here with more festivals and more installations that get the public involved in art.